The weasel and the pigeons: A Christmas story about lawyers in general practice « Hercules and the umpire. I relate to lawyers in a general practice, particularly a rural general practice. They labor in obscurity and mostly for small pay. But, they do good work for real people. Along the way, they build up strong relationships with their partners and clients. Frequently, they also have real stories worth the retelling. Firm started with Grandpa Carl who was country lawyer. Liked his beer, cigars, betting horses, and cockfighting. My dad and his bro Ed joined in 1950s. McMahon&McMahon. First office on Broadway in Saratoga Springs [New York]. Moved to present location (location, location) on Lake across from SSPD in 1956, Cousins Pete and John Coseo [later] joined firm . . . . I worked off and on since . . . doing legal and medicolegal research, etc. Excitement at the law office today! A mink/weasel was trapped in the office! We had been hearing weird noises overhead for 2 days- pigeons cooing, but other scampering noises. It’s an old row building and birds, especially, try to get in and nest. This AM, my co-worker who comes in early heard something when she came in. She ran upstairs to her desk and heard something running up the stairs after her. Then she saw it dashing around and said it looked like a weasel. She shut herself in her office and called Dad and Pete [cousin]. Pete came in from the back lot, left the door open, and rummaged around hoping to drive it outside. Afterwards, they found a ceiling panel knocked aside where it came in from the walls. Also, it chewed the heck out of the blinds in Pete’s office. In case you’re wondering, we were planning to call a “wildlife remover” . . . . [but] Pete had [a deposition] . . . with the thing running around in the walls. *He said it was pretty quiet . . . [so nothing was done to hunt the critter down]. As it turned out, the weasel was still in the office. I heard it on the cellar stairs near my work area. I was the last one out of the building that evening, so I left the mail slot slightly ajar, thinking it could squeeze out that way. We haven’t heard it since. Current thinking is it probably followed the pigeons in, hunted and ate them over 2 days, and left for better hunting grounds. I have seen mink crossing streets late at night. Another 2 or 3 blocks, and they are right downtown. 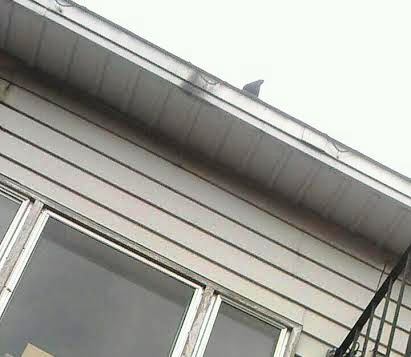 My dad misses the pigeons, sort of. They used to coo when they heard him in his office. Now, that’s a genuine story about a general practice. It has all the ingredients: a family of lawyers, a small town, weird depositions, old buildings with second story offices, scampering weasels, a cellar, fleeing secretaries and pigeons that coo until they meet a violent demise. While there are computers in use, the figurative quill pen, and all that means, is alive. Legal realism at its finest. Thanks to Jill P. McMahon for helping me remember what it meant to be a real lawyer all those many years ago. It is a very warm memory this cold and grey Christmas day. *Observation by RGK: Not the first time a weasel attended a deposition. Rich, having spent 9 years of my life in Albany, NY (about 20 miles south of Saratoga Springs), I can attest that they have varmints around there. Although it was less exciting, in Albany we had chipmunks who managed to gnaw through the back stoop and get into the house. After we chased them out, I showed them a thing or two by re-building the back stoop with cement. They retaliated by burrowing underneath the walkway leading to our front door so that the sidewalk actually collapsed as I was leaving one day, and I darn near broke a leg. More cement was necessary. I discovered that my next door neighbors were feeding the darn things peanuts, so they got habituated to humans. There also was an outbreak of rabies among raccoons there (this was actually serious). New York’s Department of Environmental Conservation did a good job responding by leaving bait around the state with a rabies vaccine. Unfortunately, one day when I was dropping something off at my kids’ elementary school, I saw one wandering around in the daylight, which was a sure sign that it had rabies and they came and I’m sure they had to put the poor thing down. The only similar excitement I’ve had in Nebraska was walking out of my office in the Admin Building at Creighton and having a bat swoop by my head. I called Public Safety, which was very blase about the whole thing. “Oh yeah, that happens all the time in those old buildings.” I responded politely: “Well it didn’t just swoop your f**king head, so please come and get the thing out of the building.” About an hour later a guy showed up with a net and walked around sort of half interested and then announced that the bat must’ve gotten out on its own. I hope the bat made its way down to the Public Safety building. Best, Pat. Oh, I have no idea why it listed me as “Anonymous,” I logged in again with my Facebook account. It is not over until the fat mustelid sings. More details tomorrow. Yeah, these frisky mammals don’t go down easily. You can never find Batmen when you need them most. All the best. Christmas day, we were getting dinner ready in the kitchen, and the phone rang. I answered it, and was surprised to hear Pete jabbering excitedly. I heard, “…fell through the ceiling…..Kitty’s office….” I was confused, because I didn’t understand how he had learned about the blog post so fast. Then, I realized he was calling from the office (perfectly describes his work ethic), and was saying that the weasel had come through the ceiling again. He chased or it ran into Kitty’s office, and he closed the doors and trapped it. Then, arming himself with a broom, he went in to do battle. Either he or the weasel (the entire phone conversation was an excited utterance on his part) managed to get one of the windows open, and the weasel bolted out of it. Pete looked down expecting to see a body twenty feet below on the sidewalk, but there was nothing. So it either managed to climb along the building façade or survived the fall and ran. Upon direct questioning of Pete at work today, I found out that what he encountered was a squirrel (bummer!) on the loose in the building. He had come into town and on entering the office heard scrambling noises overhead. Going upstairs he found a chewed up ceiling panel and chewed up plaster and lathe. At that time, he still thought it was a weasel and cautiously stuck his head up over the landing to see if he could see it. All he saw was a gray blur of motion, tearing around rooms, over file cabinets, etc. At some point he realized it was a squirrel, and managed to trap it in Kitty’s room. And as it turned out, he couldn’t find a broom handy, so he went in after it with a folding chair. The rest of the event, I heard accurately. He did open the window and the squirrel did leap out of it. It’s pleasant to imagine him in Kitty’s room with the squirrel going ballistic and Pete acting like a lion tamer. One of those times when you actually wish for a surveillance camera. Where is the NSA when you need them? I admit to being disappointed that all along it probably was a squirrel. Kitty has lived in the woods long enough to know what a squirrel looks like, but adrenaline does funny things to you. I like to think that the initial visit was a weasel. We still haven’t heard the pigeons cooing, and there are my own multiple observations of mink crossing a street three blocks from Broadway at night. There is plenty of wildlife in this small city, especially at night. I have an opossum that frequently visits my garage and sleeps there in an old cat bed on especially cold nights. Red fox, deer, and the occasional young black bear wander in from the outskirts often enough that it’s entertaining, but not surprising.